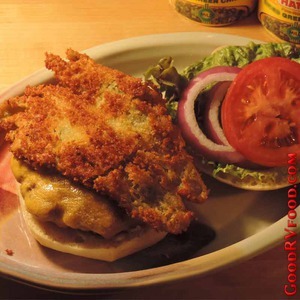 Monroe's restaurant in Albuquerque serves a wonderful chile relleno (re-YEAH-no) burger that I just love. To me this is what all burgers with toppings like onion rings or french fries aspire to be. The relleno by itself is a wonderful combination of cheese, texture, and spicy flavor. Each makes any burger better. Combined they make a burger great. In the RV I decided it was a lot of extra work to stuff the cheese into each green chile and fry it if everything was just going to go on top of the burger anyway so I took a short cut and put the cheese directly on the burger. This one change saved time, made preparation easier and made cleanup easier too. You can use any cheese you like. Monterey jack and pepper jack are my favorite choices on this burger but I think a nice creamy blue cheese would be wonderful too. Depending on your appetite make two or four patties from the ground beef. You will need one green chile for each patty. In a frying pan heat about half an inch of oil. You will need three bowls. In the first bowl put the flour. In the second bowl mix the egg and milk together. In the third bowl put the Panko crumbs with some taco seasoning for flavor. I like to put these in order leading up to the frying pan to limit drips so cleanup is easier. Cut the chile peppers lengthwise into large flat strips. Dip each strip first in the flour shaking off any excess, then the egg+milk mixture, then the seasoned Panko crumbs. Fry, flipping once, until golden brown on each side. Transfer to a paper towel to drain. Cook the burgers until done the way you like. I like melted cheese so I put the cheese on top of the burger right in the pan a couple of minutes before it is done on the second side. If needed covering the pan with a lid helps the cheese melt faster. Place the burgers on good quality buns. Top with the fried chile peppers and any garnish you like including tomato, onion, lettuce, guacamole and whatever else suits your fancy.